Although most desktop 3D printers have build envelopes confined to a space no larger than a typical microwave oven, we have been seeing an extraordinary number of very large 3D printed objects as of late. Through the development of software that allows users to break 3D models down into numerous sections which will print in their specific 3D printer, and a little bit of ingenuity on the part of designers, the build envelope of your 3D printer is no longer a major limiting factor. This certainly was the case for one Polish 3D printer manufacturer last month, called Aye Aye Labs. The company, which produces a rather unique looking machine with a rather unique name, the HotRod Henry, was present at the 3D Printshow London late last month with one rather unique 3D printed statue. In order to show off the capabilities of the HotRod Henry, Aye Aye Labs turned to none other than former Beatles bassist and singer Sir James Paul McCartney. If you recall, back in March we covered a story in which McCartney released a 3D printable model of himself for anyone to download and fabricate from the comfort of their own home. Since then we’ve seen numerous 3D prints of this model, but nothing like the one which Aye Aye Labs revealed recently. The statue on display at the show was larger than life, quite literally. While McCartney stands at approximately 5’9″ tall, the version of the singer that was printed and on display was a tad bit taller. Printed with a bronze colored thermoplastic from an Italian company named FiberForce, and using the Micron3DP extruder and HotRod Henry 3D printer by Aye Aye Labs, this extra large statue was fabricated in only around two dozen pieces, which were then all glued together. The HotRod Henry machine was able to accomplish this task in a relatively small number of prints because of its rather large build envelope of 350mm (W) × 350mm (D) × 600 mm (H). It’s awesome to see companies like Aye Aye Labs thinking outside the box, creating attention grabbing pieces in order to show off the capabilities of their machine. The company said that they used a rather large layer height for this piece, simply because most individuals will be viewing it from a distance, not to mention the print time would have increased exponentially with finer layers. As for the future of the Sir Paul McCartney statue, we’re not totally certain–however, it’s likely that the company will continue to use it for trade shows and promotions in the future. 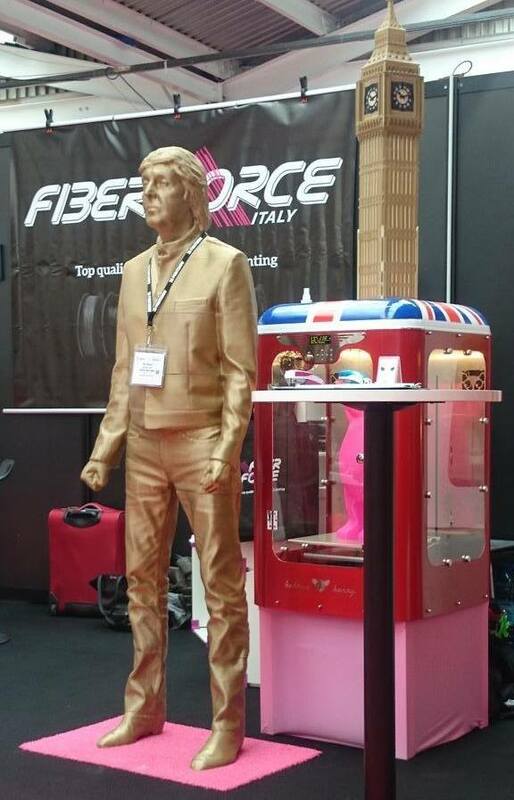 Were you on hand at the 3D Print Show in London to see this incredible piece in person? Let us know in the 3D Printed Paul McCartney forum thread on 3DPB.com.